I loved the look of this pattern from the moment it released and was so excited to make it. But then I made my super wintery version in August, planning for the colder months ahead and was depressed when it kept being too warm to wear it. But the temperatures have turned and I've been wearing it loads now! 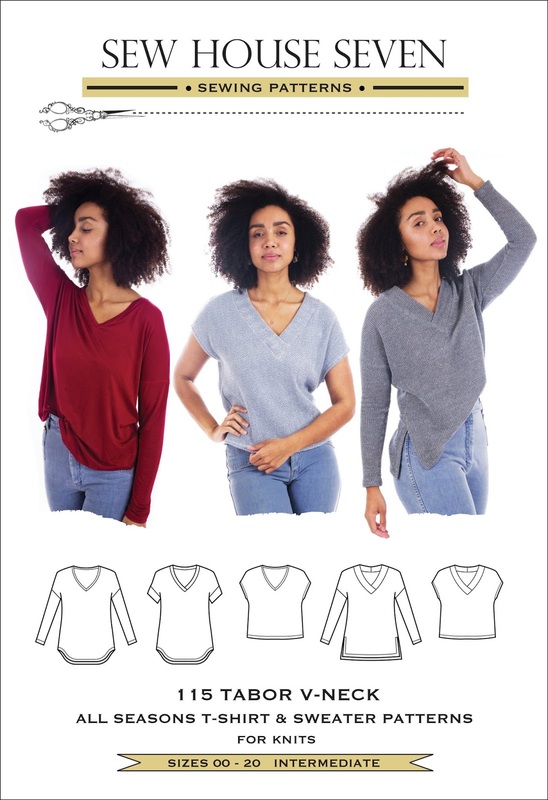 The Tabor V-Neck by Sew House Seven is a dropped shoulder, loose fitting v-neck t shirt and sweater with lots of sleeve, neckline, and length options. I made the sweater option with long sleeves, split hem and a thick chunky v-neck. My fabric is a medium weight (but quite chunky) Telio cable knit from Fabric Dot Com. This denim color is out of stock but they have other colors available. I turned it perpendicular to the grain so that the cables would run vertically, since typically cable knits do. The stretch was enough in both directions that it didn't matter. This fabric does have some drape, but this is probably about as heavy, chunky and stiff as you'd want to go with this pattern. It recommends fabric with a lot of drape, and not too much spandex (no more than 5%) so that its not too stiff. With the loose nature of it you don't want it to come off really boxy. 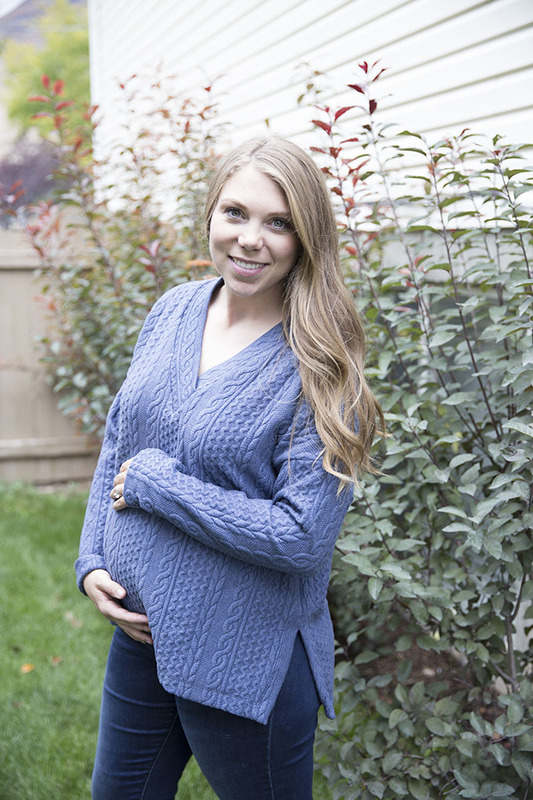 Mine is quite boxy, especially because of pregnancy but still nice and wearable and perfect for cooler months. I did not make any maternity mods or add any length. I made it using my pre-pregnancy measurements and decided the length was good for when I'm not expecting so if I lengthened it now I would just want to shorten it later, which I'm far too lazy to do. I love that thick neckband, but if its too chunky or masculine for you the pattern has a thin neckband too and two different options for the v neck - I did the overlapped version. The side vents are my other favorite part. I have always loved vented sides and have added them to quite a few other patterns as well. I think I'll make this one again but maybe lengthen the back so its just slightly longer than the front, and in a thinner more drapey fabric. 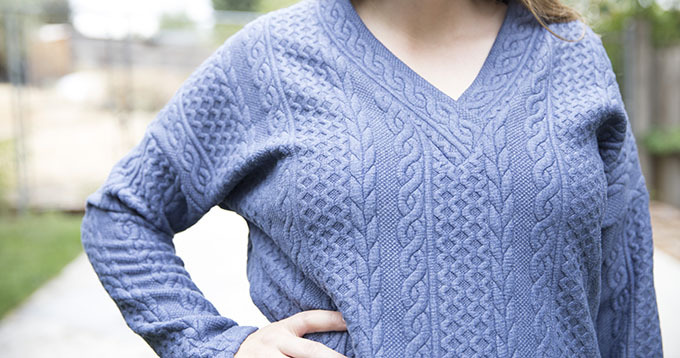 I love this sweater even in a chunky knit and wear it all the time. As the temperatures have dropped I find myself pulling it on as my go-to sweater. So surely I need to make another, right? When I'm not pregnant and we're going into warmer months I'll make the other versions of this pattern but for now I'm enjoying my chunky, warm Tabor! Have you made one? What view is your favorite?